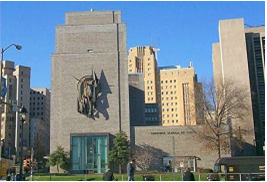 The Department of Biostatistics in the Graduate School of Public Health (GSPH) at the University of Pittsburgh shares an affiliate membership with the Department of Statistics at Pitt. Biostatistics was one of the original departments in GSPH when it was founded in 1949. Faculty members in the department develop new statistical methodology and provide the quantitative component to public health and biomedical research efforts that have had a major impact on the prevention and treatment of disease. Graduates from the program have assumed leadership roles in academia, industry, and government. The Department currently has 31 full-time faculty members, and more than 100 students enrolled. Approximately ninety research and support staff participate in our educational and research programs. In addition to an extensive collaborative effort, the Department of Biostatistics is committed to the development of statistical methodology. Areas of methodological development include clinical trials design, comparative effectiveness, exploratory data analysis, inter-rater reliability, missing data analysis, ROC analysis, sampling techniques, sequential methods, statistical genetics, stochastic modeling, and survival analysis.